That’s right Link. I’ve seen you traipsing around, acting like you invented horse mounted combat. I think the Dovahkiin might have something to say about that. THE POWER OF MOUNTED COMBAT HAS COME TO SKYRIM…errr, sorry for the yelling text. So yeah, it’s about damn time. And it seems to work pretty well. I’m happy to be able to fight on my horse now, instead of having to dismount and hope the damn thing doesn’t get into it’s own fight and get itself killed. Now we all wait with bated breath for the Dawngaurd expansion. I was hoping for a sword through the chest. Brilliant! Link’s face of fear, shame and regret in the last panel is awesome. Still clueless about skyrim. Don’t want to start either. Considering this is Link, so a red potion should clear that all up. Or a visit to the whore’s house in Zelda 2. 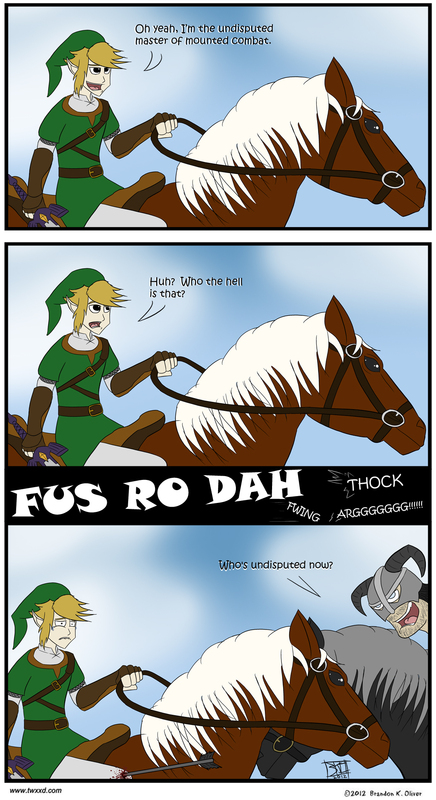 Oh no, Epona! Look out! Link is screwed. That’s what he gets for being so damn cocky. Never look a war horse in the mouth. Epona, listen, just for me? Ditch Link and run for it! *sigh* I wish I had a computer that could play skyrim… then again, I don’t think I need another distraction! Good job joining the two games! The old arrow in the knee trick. That’s gunna affect his gym workouts. Guess the 350lb squats will have to be skipped now. And things just won’t be the same on his dates with Zelda. He didn’t wear knee protection!